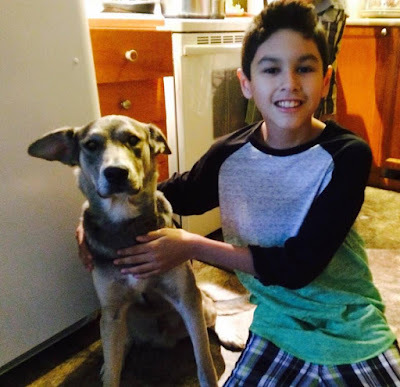 Many indigenous communities in Ontario face similar problems with their dogs. The weather can be unforgiving, and there is a lack of proper veterinary care to oversee the pets' health. By no means however, does this mean the owners of these pets care for them any less than you or me. In many cases these dogs are not feral as one would assume, rather much loved family members. Thankfully there are legitimate organizations who work together with these communities to improve the care for these pets. 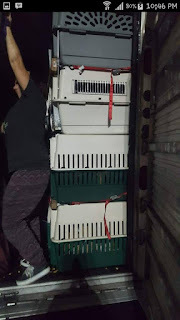 Some set up spay/neuter clinics for a specific time frame, some ship food and medical supplies to the communities, and in some cases dogs are taken from the community to receive necessary veterinary care, to then be returned to their families when they are healthy enough. The rescues are able to continue helping thanks to generous donations from animal lovers. Unfortunately, as is often the case in the animal rescue world, there are unscrupulous individuals who act in the best interests of themselves and their pockets rather than the animals they purport to help. Recent years have seen a significant increase the number of reported cases of dog theft in these communities. Animal, "rescues" will go to the communities with the promise of taking dogs away to receive necessary veterinary care, only to then steal the dogs and adopt them out for profit. One such case occurred November 12 at the Long Point First Nation, one of Quebec's nine Algonquin communities, located in Winneway, Quebec. A, "rescue" went in with a trailer big enough to transport 40 dogs. According to LA Bowden, an animal welfare advocate who has regularly worked with indigenous communities, by the end of the trip 27 dogs were removed from the community. Some of the dogs were feral, while others had families. Seven of these families now contend their dogs were stolen, and some have filed police reports. 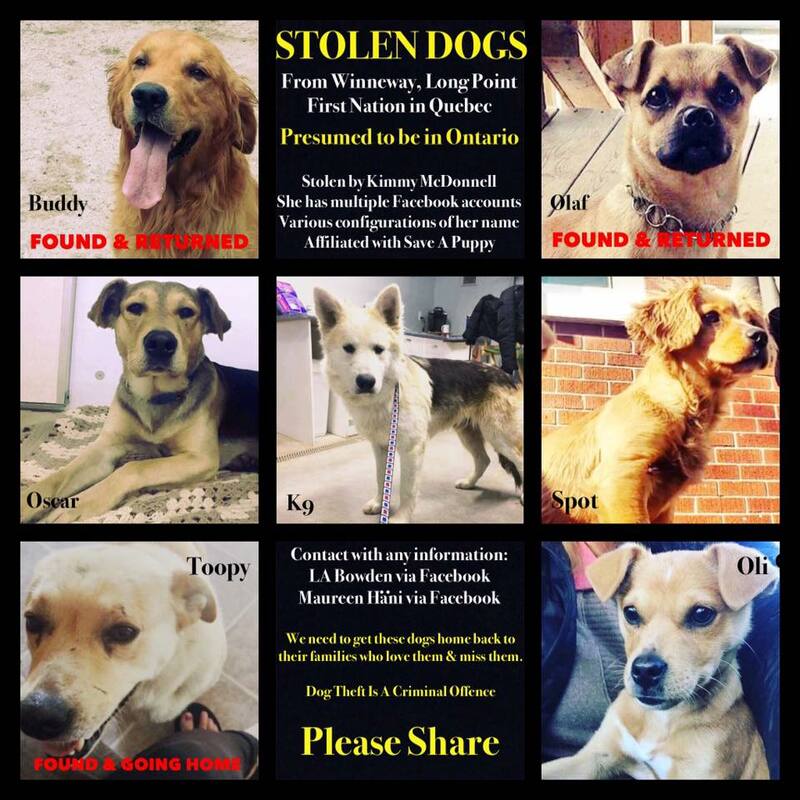 As a result of social media outrage, two of these seven dogs have been returned, with one more en route as I write this. That leaves four more dogs, that we know of, that need to be returned. One of these dogs is Oscar, who was taken as Diane Polson's son watched the transport truck drive away. Ms Polson contacted one of the, "rescuers" Kim McDonnell and demanded her family dog be returned. For days Ms. Polson was given the runaround, with Ms. McDonnell offering excuse after excuse, ranging from the dog she took actually not being Oscar, to him being adopted with no chance of recovery. In fact, Ms. McDonnell offered Ms. Polson an Xbox to compensate for her family's loss. Ms. Polson stated she had no interest in an Xbox, her son wanted his best friend back. I can only imagine what this family is going through. The second dog is Spot (seen below), who according to Ms. Bowden has been renamed, "Lucy" and adopted out by Carrie Faulkner, co-founder of Moms 4 Mutts Animal Advocates KW Area in Cambridge, for $450. Spot's family has filed a police report, while Ms. Faulkner contends that Spot and Lucy are not the same dog. The third dog is named K9 (seen below), an 8 month old Husky/Shepherd mix. Ms. Bowden says K9's family did not sign any consent papers to have the dog removed (no papers were signed with regard to any removed dog), and he was last reported seen at Wagtime Boarding Kennels in Ontario. The fourth and final dog being searched for is Oli. Ms. Bowden contends that Oli (seen below), renamed Jaxon, was being fostered with Wally Walks, who have now stated that he has been adopted. Since new information has come to light about Oli being stolen, Wally Walks has made its Facebook page private. The fake, "rescues" that commit these thefts know no moral bounds. Ms. Bowden is currently scheduled to testify in a court case against one women who pretended to rescue a Husky from an unsuspecting family and then actually dyed the dog's hair in hopes of covering her tracks. After six months Ms. Bowden was finally able to locate the dog and reunite him with his family. People who see pets as nothing more than commodities to line their pockets will stop at nothing to achieve their goal. It's up to all of us to step up and speak for these poor dogs and their families. Please share this article and if you know the whereabouts of any of these remaining stolen dogs, contact your local authorities immediately. MOST IMPORTANT - NEVER GIVE YOUR DOG TO ANYONE WITHOUT SIGNING A FORM OF RELEASE!!! A legitimate organization will have you sign a paper authorizing them to take your dog and bring the dog back to you after the proper veterinary care. I will be updating this story as these remaining dogs are returned to their rightful owners.